Efficient Design for Contemporary Living. Integrating contemporary design with efficient Valor heat, the H4 is one of our most versatile fireplaces to date. Choose from two different (Landscape and Square) backing plates and one of three designer bezel window trims in Copper, Nickel or Black. Tahoe Clean-Face Deluxe models feature our Contour tube-style burner, designed to complement the hand-painted ceramic fiber log set, and produce a natural dancing flame. 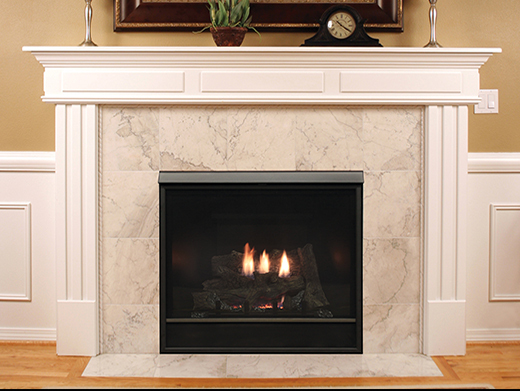 The Clean-Face Deluxe Fireplace comes with a discreet air distribution channel that eliminates the look of louvers, yet still allows you to operate the optional blower. It features a large heat-resistant, tempered glass window that provides an unobstructed view of the log set.